Welcome to the St. John Vianney Music Ministry! The Adult Choir will not rehearse on March 6 due to Ash Wednesday Mass as well as on March 20 due to Spring Break. Have you considered joining the Choir? Do you love to sing? Do you play an instrument? At this time we especially need Sopranos for the 11:00am Mass and Tenors and Basses for all Masses. No prior experience is needed. The Treble Choir (Children&apos;s Choir) sings at the 11:00 Mass on the 1st Sunday of the month. Rehearsals are Wednesdays from 6:00-6:45pm in the Music Room (located in the Church). The Youth Choir/Band is comprised of High School and Middle School students who sing or play an instrument at the 11:00am Ablaze Mass on the 1st Sunday of the month. Rehearsals are 9:45am-10:30am on the 1st and 3rd Sundays of the month in the Music Room (located in the Church). 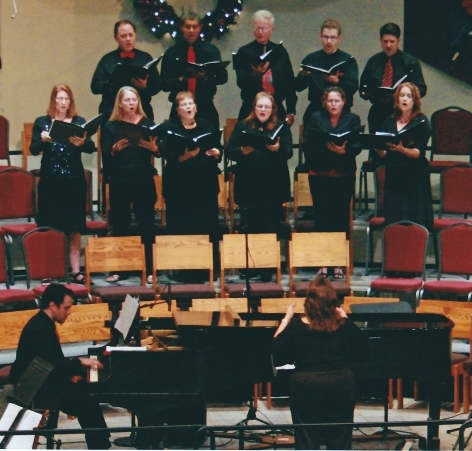 The SJV Music Ministry is an active group made up of singers and instrumentalists of all ages. Our primary purpose is to support the congregation in singing at Mass. Members of the Music Ministry regularly participate in Diocesan Liturgies and community events in addition to serving at weekly Masses at SJV. We always welcome new members to any of our ensembles. You do not need previous choir experience just a commitment to growing and learning with us, both spiritually and musically! Instrumentalists should have at least one year experience on their instrument. call 512-218-1183 ext 107, or email Susan Leach for details.